Keeping on the theme of Dynamo and drawing setup, I had a series of MEP models that I needed to setup that had 2 views that needed to be placed on each sheet, a main view and a smaller inset view. I started from my sheet generation Dynamo graph and ran through a number of different options to enable to graph to place multiple sheets on views in the correct location. I then threw together a quick graph that allowed me to select the viewport I’ve placed on the sheet with the Select Model Element node and running that through the Rhythm node Viewport.LocationData I can get the centre point of the viewport box. This centre point of each viewport will be the values used when we move the viewports later. Once the viewport locations are picked up, we can get to modifying our original sheet creation graph. The first modification that we need to make is with the additional column in Excel. Copy the original section of the graph and change the code block to 3 so that we are reading from column D of the excel file. The next step we filter our views again, but this time we’re filtering two separate lists of views, things get a little messy but it’s still reasonably easy to manage. Note that I dropped a List.Clean node in the mix as I was having views return with no data, the List.Clean node removed empty and null values. Remember that if you’re going to clean the list, you need to feed the other nodes with the cleaned list, do not mix and match between clean and unclean lists, otherwise you’ll have a bad time. Now we should have two lists of element ids, one for our main views and another for our inset views. Our main views get fed through the same series of nodes from the moving views on sheets post. So while all of this is happening, where the output of the Sheet.ByNameNumberTitleBlockAndViews node shoots off a second time to tell our insets what sheets they need to be placed on. The problem you will stumble into when placing views in this method is that if the sheet hasn’t yet been created, the inset views won’t be placed. 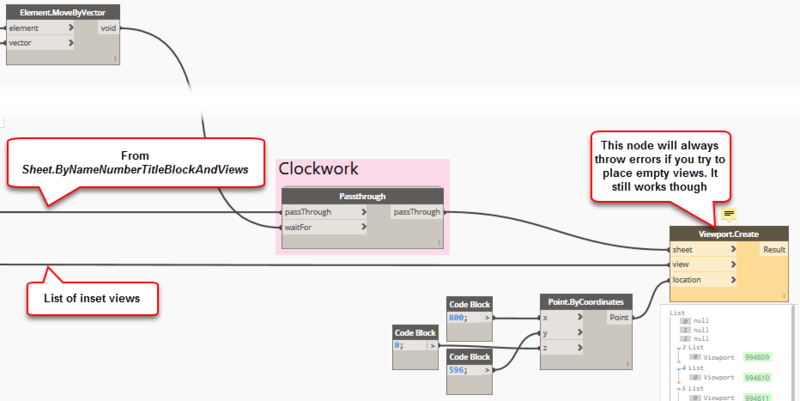 The way that I decided to handle it was by using a Passthrough node from the Clockwork package. The Passthrough node implements an order of execution. It will wait for the node threaded into the waitFor input to complete before sending on the data threaded into the passThrough input. I fed the Passthrough node with the results of moving the main viewport on each sheet, once this main views have been moved the sheet numbers are sent through to the Viewport.Create node. Running the script, we end up with views placed exactly where they want them. The example GIF below is recorded in real time and runs for 14 seconds from start to finish, which includes checking each sheet has been correctly created. This is great and all, but what happens when you have two difference types of “main” views, one where you want placed along with an inset like the above example and another where you ant the views placed centrally? The way I found best to handle this scenario is to add a String.Contains node along with an if node to control the location of the viewports depending on the name of the view itself. In this particular example, the names of the “main” views are being checked for if they contain the string Platform Level_ and if they do, the views are being placed centrally on the sheet, otherwise they’re being placed offset from centre to allow for the inset view to be placed on the same sheet. The nodes labelled platform view x, main view x, platform view y and main view y are simply code blocks that I have renamed so I know exactly what they are.